LONDON , Oct. 10 /CSRwire/ - As environment, industry and finance ministers gathered in Paris to sign what was about to become a historic climate deal, Landsec executives were plotting their own move to take responsibility for our changing planet. For it was at the UN’s COP 21 gathering in the French capital that those running the UK’s largest commercial property company – with a portfolio of assets, including shopping centres and offices, worth some £14.4 billion – decided the time was right to take their environmental impacts more seriously. As the only real estate business represented at the UN meeting back in late 2015, it had an opportunity to cement itself as a true leader in tackling climate change and knew it needed a bold goal to achieve it. So, rather than making incremental improvements in the operational efficiency at each of its 120 different assets, the business decided to align its ambitions with the best available science. “Adopting a science-based target seemed like the obvious next step for a company like ours,” says Tom Byrne, Landsec’s Energy Manager. The number of companies setting science-based targets for reducing corporate carbon emissions continues to grow. They are bold, ambitious and leading goals which, if met, will keep the average global temperature increase below the 2oC threshold beyond which most of the world’s best scientists say the world will face irreversible environmental damage. So far, more than 70 businesses have set such targets, adhering to the strict criteria of the Science Based Targets initiative, with a further 230 committed to do so in the future. Since 2013, energy saving measures by Landsec have helped result in a carbon intensity (kgCO2/m2) reduction of 19%. By 2030, that must come down by 40%, in line with the science, and setting it on a path to achieve an 80% carbon intensity reduction by the middle of the century. The company hopes that this will be achieved in a number of ways, not least the use of technology and innovation. 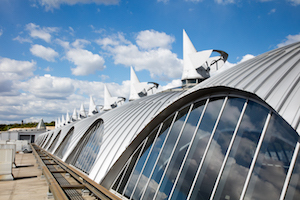 For example, the natural ventilation system that has been installed at the 154,000m2 Bluewater Shopping Centre in Kent, has allowed for the air conditioning to be turned off, saving 13% energy. The low-carbon fuel cell installed at 20 Fenchurch Street – London’s ‘Walkie Talkie’ building – cost £4 million, but contributes 7% of the entire building’s electricity needs. Landsec are also committed to improving the amount of onsite renewable technology with a new target to achieve 3 MW capacity by 2030. Current capacity has doubled to 1.4 MW this summer with their largest installation to date, a 785 kWp solar PV system at White Rose Shopping Centre in Leeds. The system provides 20% of all landlord power, reducing costs for customers and increasing the asset’s resilience, and has become the largest of its kind in the UK. Elsewhere, site specific energy reduction assessments continue to find more energy reduction opportunities. The 65 projects agreed last year cost around £2.4 million, but will save customers 7.7m kWh of energy and £877,000 a year in reduced energy bills, with a ROI of under 3 years. Adopting a bold, science-based target is a move that has had a much bigger impact than first realised, he adds, transforming energy management programmes, which rather than purely focus on operational activities are much more strategic. There is now a more stringent set of requirements for making sure new developments are more sustainable, and a new Responsible Property Investment Policy demands a consideration of sustainability when acquiring new assets, meaning carbon, as well as costs, are formally considered by the Investment Committee. “Our staff have really got behind it too,” adds Kate Attwooll, Sustainability Executive “We have a long history of creating jobs and opportunities and our people are very passionate about that. But things like energy efficiency have always been seen as a bit too tech-y to really bring our teams together. But that’s changing. We have new training programmes to make sure that everybody knows sustainability matters.” Group-wide KPIs focused on energy management have certainly helped to focus the mind, especially when performance determines bonuses – not only for the CEO and board, but for junior execs too. Click here to read the full case study, including analysis by Institute of Business Ethics and a look at Landsec's Westgate retail destination.